#1 – Prevent ice in the guides. Ice is extremely bad for fly line. Technically, frozen water has all the characteristics of a mineral, including the abrasiveness of multiple tiny blades. If at all possible avoid shooting line with ice in the guides. You can do this by practicing a “fixed line” technique (often Czech nymphing styles work best), or by eliminating ice altogether. One good option is Pam cooking spray. 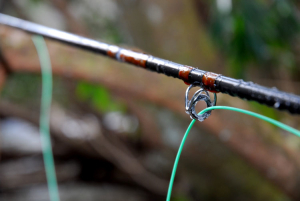 Carry a small can with you and spray down your guides before the rod ever gets wet: the oil molecules will prevent the water droplets from adhering to the guides, meaning they will fall off before they freeze. Be sure to re-apply every hour or so, and at the end of the day, simply wash your rod sections in warm water and mild dish soap. It’s also a good idea to wash the line in the same sink, then wipe it with a clean cloth to avoid gunking up. Dunking a reel is natural for many of us, but on a sub-freezing day, you may as well glaze your reel in epoxy. Inevitably once dunked the water soaked up by the backing will freeze solid, locking your reel in place and shutting you down for the day. Seeing a trend here? Many of the issues with winter fishing have to do with moving parts in the line and reel setup. 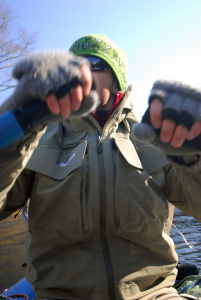 A Tenkara rod eliminates both reels and guides, leaving few obstacles to winter time fishing. 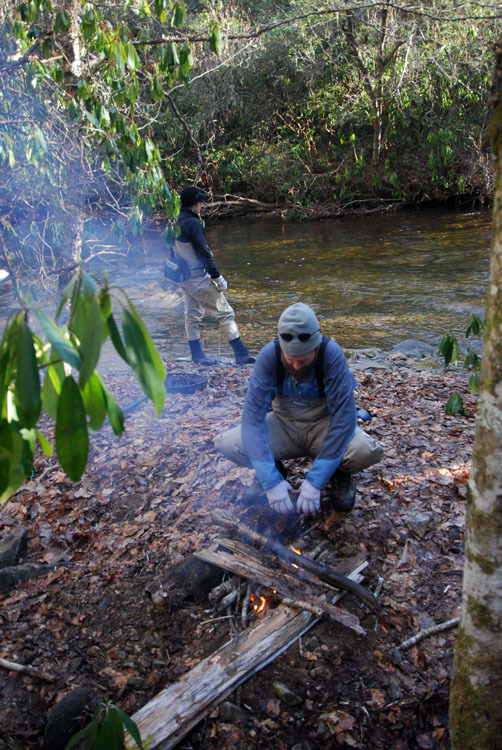 It’s also a great setup for doing a little midge dry fly fishing–and midges have been known to hatch in between snowflakes. Nothing will make a cold winter day seem brighter than a warm, crackling fire burning nearby. River levels in winter tend to be low, leaving an abundance of driftwood high and dry. You don’t need a Samhain bonfire to keep comfortable by the river–you’re going to be in the water most of the time anyway. The right-size shore fire is a stick fire that you can warm your hands over while taking a break now and again. In especially wet areas even in wintertime you may have issues getting a shore fire started. Consider bringing along a piece of firestarter log to tuck into the core of the fire, or pick up a cheap magnesium fire starter stick. Use your pocketknife to shave a few splinters of magnesium into a pile and surround with dry matter like pine cones. Magnesium burns like a thousand suns, and it’ll usually be enough to kick even damp wood into gear. We live in a synthetic society. Patagonia, North Face, Simms; all our favorite outdoor companies seem to specialize in this or that polypropylene product meant to wear next to our skin and keep us warm. These products work great on the ski slopes, where they add loft while passing sweat straight through to a Gore-Tex layer to be exhaled out of the fabric. Unfortunately, they’re just not as effective in a fishing environment, which tends to be a much slower-going affair. This is where wool comes in. Although expensive, wool long johns from companies like SmartWool (or periodically Patagonia or Simms or whoever has rediscovered wool this season) are worth it. They last years and years, are machine washable, resist odors, and most importantly they are warm–warmer than synthetics. On especially cold days I will wear a baselayer of wool underwear then place high-loft fleeces on over that, giving me a neutral air layer to retain heat while still letting moisture evaporate. Wool’s great at what it does but it has a limitation: you can only wear so much of it. By the time the wool layer is as thick as a warm sweater, you’re going to be, well, sweating. Sweat means water retention and thus dampness, which makes you cold. Luckily in recent years there’s been a huge resurgence in down outerwear, driven by the sleeping bag industry which created a market for sorted down. With a mass of high-quality “800+” fill feathers available, the garment manufacturers were finally able to scale down their down-lined product, resulting in the new trend of Micro and Nano puff clothing. These jackets are worth their (admittedly minimal) weight in gold. One trick I’ve found useful: buy a size smaller than normal. Down is inherently compressible, so for an active activity like fly casting, it’s best to force that coat close to your body. Buying a size down also gives you the option to buy your normal size and wear it as an extra layer if you need even more warmth. I wear a men’s medium but own Patagonia Down Jackets in both size S and M. On especially cold days, both go on under my shell. The fastest way to give yourself frostbite is to cram your feet into overly tight boots and then stand in a stream of near freezing water for a few hours. Many anglers make the mistake of thinking more is better and will even don two pairs of socks. This is a terrible idea: you need blood circulation and loft to keep warm. In reality, BETTER is better, as in better quality socks. If you’re fishing in sub-20s temps in cotton tube socks, you might as well book your trip to the doctor for the next day. Invest in one pair of really great wool wading socks and use them. Nothing is worse–or more dangerous–than falling in a freezing cold river on a day when temperatures are below freezing. This is a genuine you-could-die situation. Bring a wading staff and take your time. One further note: felt soles tend to accumulate snow. On days when snow is on the banks, wear rubber-soled wading boots instead, ideally with spikes or outfitted with sheet metal screws as cleats. 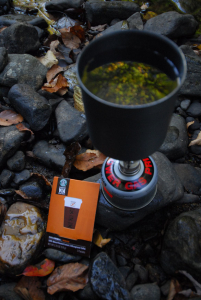 On a cold winter day, I ALWAYS carry a portable camp stove, fuel, and two different means of making fire. If I fall in the backcountry and break my leg, I might not be able to get out as quickly as I’ve planned. With my stove I can always at least boil water and drink it to keep warm. This also makes for a great mid-day treat of hot ramen noodles (I recommend the high-end Nonshim Ramen — mmmm.) And don’t forget to bring a few sleeves of instant coffee, like Starbucks’ excellent Via. Nothing warms a cold day faster than conversation with friends. Having a backup angler is a good idea any time conditions are potentially dangerous, and it’ll give you someone to share your misery with. 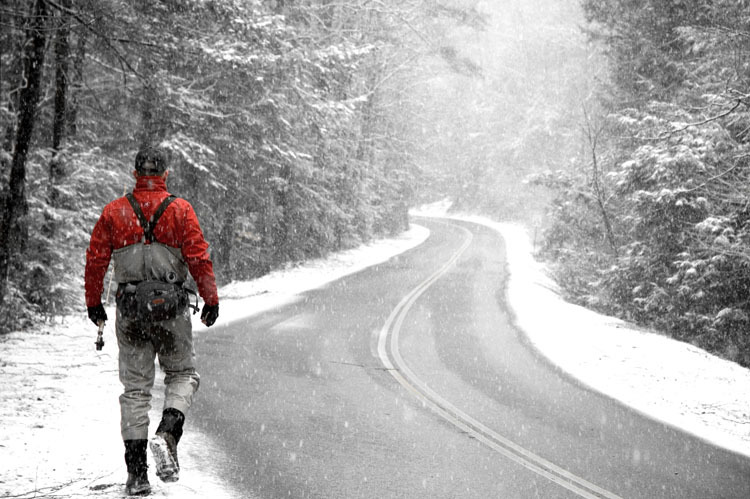 10 Responses to "Ten Cold Weather Fishing Tips"
Zach – a most excellent article, both for content as well as for beautiful wordsmithmanship. If you drop you reel in the water your day isn’t over just yet. Return to your car place your reel wrapped in a towel on your front dash and crank the heat on defrost. You’ll also get to warm up your finger tips. So amazing, now I learn more about fishing. Thank you so much for all your useful information! This proves that indeed you can fish during winter! No down time for my gears then. Thanks for all the tips and suggestions, they will definitely come in handy. nice article; very thorough as usual. nice to hear from you.